Over the past ten years, more people have been trading stocks at home. Many people got fed up with high broker fees, while other people felt they could do a better job themselves. Whatever the reason, people are now trading stocks at home more often. 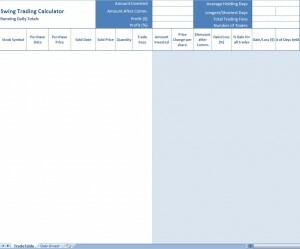 If a person does a lot of swing trading, then they should consider looking at a free swing trading system Excel template. This template has the capacity to help a person track their trades. By tracking trades, a person can improve how they trade, and possibly learn some new ways to trade based upon their previous trades.